Have you been injured in an accident that wasn’t your fault? Was it an avoidable accident that happened due to someone else’s negligence? Then you may be able to claim for compensation. We are Legal Expert, a trusted legal advisor who works with some of the top personal injury solicitors in the UK. If you have suffered from a finger or hand crush injury, lost the tip of your finger, or a finger injury at work then you could be owed thousands of pounds in compensation. Call us today on 0800 073 8804 to speak to one of our friendly advisors. See if you have a valid case and out how much you hand injury compensation amounts, cut finger compensation or finger crush injury compensation you could be entitled to claim. In this case study, we are going to look at the incident of a 55-year-old man suffering from a crush injury on his fingers. This finger injury happened at work, where he was operating machinery. Whilst working, the man, who for privacy purposes will be called Mr F struck an operating switch with his elbow, which caused a press to come down on his fingers. The most severe finger injury was his ring finger. The incident was reported to the man’s employer, who recorded it in their incident report book. Once admitted to a hospital, the man, unfortunately, had to have the tip of his ring finger where the main crush injury had occurred, amputated. His other fingers were left scarred and a tingling sensation remained, which doctors believe will be permanent. As a result, Mr F had to permanently give up some of his favourite spare time pursuits including calligraphy and playing the guitar. He was also left with less manual dexterity in his damaged hand, which he felt reduced his employment prospects in the future. Under the 1974 Health and Safety Act employers are required to identify hazards (things in a workplace that can put employees at risk) and put control measures in place to mitigate those risks. Mr F maintained that the machinery he was operating should have been fitted with a guard, personal protective equipment should have been provided and that his workstation was too small. How was the Case Concluded? Rather than go to court, Mr F’s employer (the Defendant) agreed to pay him compensation in an out of court settlement. As an amount for lost fingertip compensation, he was paid £13,500. As a breakdown £2,700 was awarded for the difficulty he may experience in the future finding work, £900 for post-care costs and £9,900 of his claim was awarded for “pain suffering and loss of amenity”. 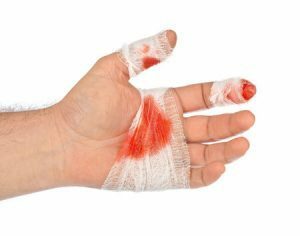 If you would like to claim compensation for a finger injury at work, then don’t let financial worries put you off. Many of the solicitors that we work with offer a Conditional Fee Arrangement (CFA). This is more commonly known as a no win, no fee service. What this means is that you will not have to pay for the service the solicitor provides you, until you win your case. This means there is no financial risk to you, making no win no fee a more stress-free option. If you were involved in an accident that was caused by someone else’s negligence that left you with a finger crush injury or a finger injury at work, call Legal Expert on our free number for advice on making a no win no fee compensation claim. Are you interested in making an accident claim for a hand injury that you have experienced? We can provide you with information on hand injury compensation amounts that victims claim, cut finger compensation, lost fingertip compensation and how much compensation you can claim for a finger crush injury, or a hand injury at work. Call us today on 0800 073 8804 to speak to one of our understanding advisors, who will assess whether or not you can make a legitimate claim and will be able to estimate how much compensation you can claim for your hand injury. Why should you trust us to help you? At Legal Expert, we work with some of the UK’s top personal injury solicitors. Whatever your circumstances, we can match you to the solicitor with the right expertise to handle your case. Some of our solicitors have over 30 years experience. What’s more, they will fight aggressively to get you the maximum amount of compensation that you are entitled to claim. You could be awarded tens of thousands of pounds in compensation, so call Legal Expert today to see what your claim could be worth. You can learn more about finger injury claims by consulting our guide. Help and advice for claimants who were involved in an accident at work. We can help you claim compensation for an accident at work. How Much Compensation Can I Claim For A Finger Injury? Help and advice for claimants involved in an accident which left them with a finger injury. Advice for claiming compensation for finger injuries.